WASHINGTON — Eric Dean made a career of calling military veterans to urge them to enroll at Ashford University, a for-profit school based in San Diego that offers online degrees. Dean, who was instructed in sales techniques at Ashford, said he tried to befriend hundreds of current and former sailors and soldiers — many from the nation's poorest communities — to convince them to attend. "I've seen the inside," Dean told NBC News in an interview, saying he had been "pressured into essentially selling my soul to throw fellow veterans under the bus" by misleading them about the educational outcomes about the school's graduation and job-placement rates. Dean, who'd served in the Navy, quit Ashford in December 2017 because he said he objected to the school's practices and now says veterans with PTSD were among his recruits. Under President Barack Obama, the Department of Education cracked down on for-profits like Ashford. With its high sticker price, questionable job placement success and 16 percent graduation rate — considerably lower than the national average of about 60 percent. Ashford was described in a Chronicle of Higher Education investigation as "a poster child for the ills of the for-profit college sector," and the school was sued by the state of California, which said said it was misleading students about tuition cost and burying them in loan debt. While the Obama Administration didn't solve all the problems associated with the for-profit college industry, it successfully created new rules intended to help rein in the worst-performing schools and to protect taxpayer dollars. Veterans and low-income Americans can qualify for large sums of federal aid, making them top recruitment priorities for for-profits. Now, the Trump Administration is trying to overturn those rules — and veterans and low-income Americans are the most at risk. Education Secretary Betsy DeVos has begun a months long process to unwind the Obama-era rules, easing oversight of for-profits' use of tax dollars and protections for defrauded students. "Instead of targeting schools simply by their tax status, this administration is working to ensure students have transparent, meaningful information about all colleges and all programs," DeVos said last year, announcing plans to overturn the rules. DeVos did not respond to an NBC interview request. "I am absolutely concerned. We may be going back to the worst of times with this industry" when minorities, poor people and veterans were the targets, Waters said. "Democrats and Republicans alike wax eloquently about their support for veterans," she said. "Anytime there is some effort for veterans people want to get on board." Trump frequently proclaims his devotion to the military and veterans. "Nobody's done more for the military than me," he has often said. But veterans are among the students most at risk from the aggressive recruitment tactics used by for-profit colleges. Here's why: For every dollar of GI Bill funding for-profit schools secure, they qualify for an additional $9 in federal student aid. For-profit schools have been eight of the top 10 recipients of GI Bill tuition and fee payments since 2009, according to an analysis of VA data by Veterans Education Success, an advocacy group for veterans that has worked against the tactics used by for-profit schools. Waters' legislation would end that incentive and require for-profits to get more of their money from students who can pay privately before qualifying for any federal aid, she said. A 2017 lawsuit by California's attorney general alleges Ashford misled prospective students and engaged in other illegal practices. Dean says recruitment techniques included avoiding direct answers about low graduation rates in order to maximize enrollment. "It was all unethical, the way we were misleading students," said Dean. The Department of Education under Obama created a "borrower defense" rule, making it easier for students to be relieved of their federal student loans if a school is found to have used illegal or deceptive tactics in recruiting them. A "gainful employment" rule required schools to demonstrate their graduates are making a living wage. An improving economy was a factor in the drop, as fewer people pursue higher education when the economy is strong. Still, schools that weren't under investigation saw their federal revenues drop by just 14 percent during the same period, the analysis found. John King, a former Education Secretary under Obama who helped write the original rules, said DeVos's efforts would have an insidious effect. "It seems these measures are intended to resuscitate the industry and allow new bad actors to emerge or to allow bad actors that have lost a lot of enrollment to be able to grow again," he said. Recruiters for the school had portrayed Full Sail as one of the top film schools in the country, Figueroa told NBC News, and had assured him that graduates were virtually guaranteed employment with various "industry partners." "It was a waste of time, waste of money and I don't even tell anybody that I went there. I feel duped," Figueroa said, claiming he had received only limited hands-on training and job placement assistance. Figueroa estimated it would take him 10 years to repay loans for the part of his Full Sail bill that 20 months of his GI funds didn't cover. Annual tuition at the school is $29,398, double that of the nearby University of Central Florida, which boasts a significantly higher graduation rate and higher post-graduation salaries, Education Department statistics show. Casey Tanous, Full Sail's public relations director, said the school's curriculum is, in fact, rooted in "hands-on" education. For any student to suggest he'd been duped is "hard to believe," Tanous said. "Film students spend hundreds of hours using gear and software that is specific to the learning objectives of the course and the program," she said, noting that any student with concerns is encouraged to "reach out to us." While Full Sail has not drawn as many high-profile legal challenges as has Ashford, it ranks near the top of a Department of Veterans Affairs list of 1,600 schools with official complaints filed against them. NBC also found 13 complaints about Full Sail filed with the Florida attorney general's office. In a statement, CTU said it "strongly disagrees" with the characterization of its recruitment. "We have a thorough process to inform and counsel incoming students. We have a strong record of supporting veterans," the statement said. Last month, Career Education Corporation reached a settlement with 48 states and the District of Columbia that accused it of misleading students about the costs of its programs, their job prospects and using "emotionally charged language emphasizing the pain in prospective students' lives to pressure them into enrolling." The company denied allegations of wrongdoing or liability. 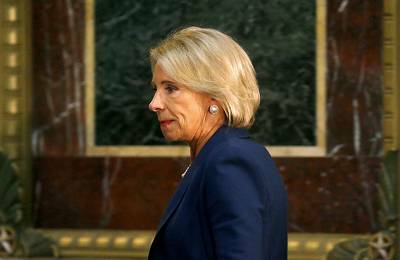 DeVos's efforts to rescue for-profits from the Obama era rules conflict with other actions the Trump administration has taken against the risks associated with the for-profit education industry. In August 2017, Trump signed the "Forever GI Bill," which restored GI benefits to some veterans whose schools had gone out of business. The Congressional Budget Office has estimated 5,000 veterans would be eligible through that legislation to receive $170 million in restored benefits over ten years. In 2018, a Department of Veterans Affairs inspector general report warned that some $2.3 billion in taxpayer-financed GI Bill money could go to "improper payments to ineligible colleges" over the next five years. Education Department spokeswoman Liz Hill told NBC News that transparency around for-profits would help weed out underperforming schools. She cited an interagency working group that strives to inform veterans about "scams." "Of course bad actors need to be shut down and taken off the field," Hill said, adding that the administration will overhaul an online "College Scorecard" which allows students to compare data on schools, including costs and graduation rates. "We're trying to give students and veterans actionable and meaningful information about all schools," said Hill. The online courses offered by for-profit schools "appeal to student veterans' need for flexibility," Hill said, as they tend to be older, married and supporting kids and family or have a disability. Still, critics say DeVos's decision to ease rules — and, separately, to reinstate an accreditor — organizations responsible for accrediting colleges — behind two major for-profits that are now defunct — will make it easier for problematic schools to prey on veterans. DeVos says the rules placed unfair burdens on for-profits that public and nonprofit institutions don't face. DeVos reinstated the Accrediting Council for Independent Colleges and Schools (ACICS), one of the nation's most controversial for-profit accreditors, after the Obama Administration withdrew the agency's recognition, citing a "profound lack of compliance" with the "most basic" responsibilities of an accreditor. A federal judge had ordered DeVos to reconsider the decision, finding the Obama administration didn't review thousands of pages of evidence. DeVos's decision is now under review by the department's inspector general. 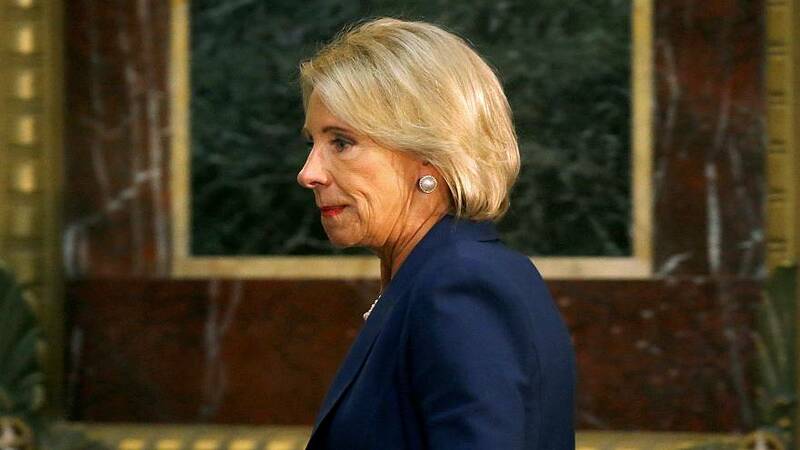 "DeVos has taken a number of steps to literally steer taxpayer money toward the very worst quality schools," said Carrie Wofford, president of Veterans Education Success, which provides free legal services and career counseling to veterans. "With the other hand, she's stripping out all of the protections students had. It's almost as if she's bent on trying to prop up a handful of bad actor companies." And Devos's team at the Education Department includes advisers who have lobbied for the for-profit school industry. One is senior adviser Robert Eitel, a former vice president at Bridgepoint Education, Ashford's parent company. Another, Principle Deputy Undersecretary Diane Auer Jones, recommended DeVos reinstate the controversial accreditor ACICS, giving it a year to fix its compliance problems. ACICS accredited two large for-profit schools, ITT Tech and Corinthian Colleges, which were subsequently shut down amid lawsuits, investigations and Obama administration sanctions. Bridgepoint has received significant regulatory attention, including a $31 million fine in 2016 by the Consumer Financial Protection Bureau for engaging in allegedly "deceptive acts and practices" regarding students' monthly loan payments. Bridgepoint denied the company intentionally deceived students and said it reached the agreement to resolve the dispute. In total, despite the Obama administration administration's efforts to rein in the nonprofit industry, eight schools have collected some $34.7 billion in GI Bill tuition and fees since 2009, according to Wofford's group. With veterans so financially desirable at for-profits like Ashford, Dean said he faced pressure from his superiors to meet monthly quotas and "enroll them no matter what." The goal, Dean said, was to keep students signed up for at least three weeks until they became "financially liable," or ineligible for a refund. Dean's claims were echoed in a 2017 lawsuit brought by the state of California against Ashford, alleging the school's sales people made "false and misleading statements to prospective students to meet their enrollment targets." The lawsuit has not been resolved. In a statement responding to the suit, Bridgepoint, which owns Ashford, said the school's online education program is a "model" for bettering the lives of "people who did not, or who were unable to, pursue more traditional avenues to degrees" and that thousands of graduates attest to its quality. In addition to Dean, NBC News interviewed a second longtime former Ashford military recruiter who spoke on the condition of anonymity out concern for retribution but corroborated Dean's claims. Dean said he left because he didn't like the company's recruitment tactics. Ashford did not comment on why he left. In response to the recruiters' claims, Ashford spokeswoman Dori Abel said the school never targeted its "marketing materials or advertising campaigns specially to veterans, low-income or otherwise." The school has a "strong compliance program," Abel said, including a whistleblower hotline. There is no record of any calls to the hotline that reflected Dean's concerns during the time he worked there, she added. Such allegations, Abel said, represented "an orchestrated effort among certain activist groups to paint our entire sector as irresponsible." For his part, Dean said he had, in fact, complained to a manager about "unethical" practices at the school some four months before he quit but never got a response. "It was exploiting their emotions," Dean said. "I'd say, 'Do it for your kids. Your family never went to college. You'll be so proud of yourself.'"